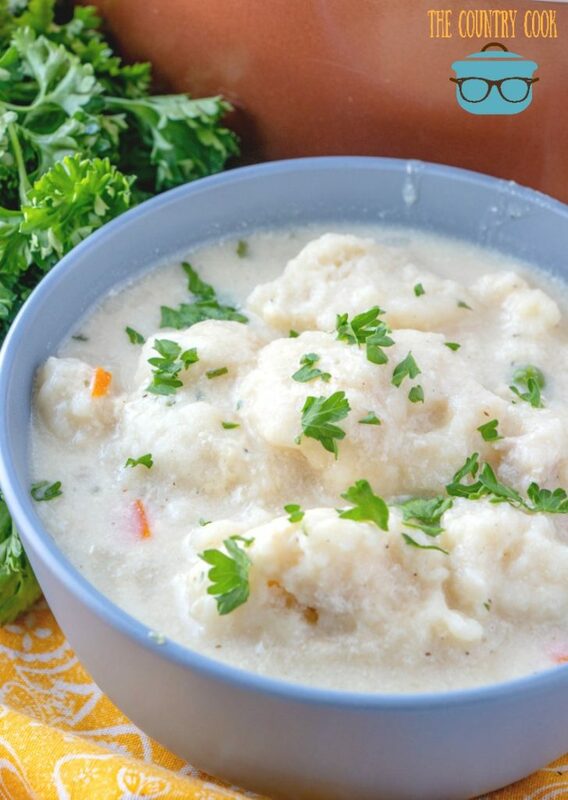 I think when a lot of folks are asked for their list of Top 5 comfort foods, Chicken and Dumplings comes up in that list. It certainly does for me. My Mom made chicken and dumplins a lot when I was younger. She usually made Chicken and Drop Dumplings. My favorite part was always the dumplings. My Momma worked long and labor intensive hours as a school custodian but she always tried real hard to make dinner for us kids. My Dad was in the Navy and was out to sea a lot serving our country. They both had tough jobs and I suppose you don’t always appreciate your parent’s hard work until you are grown. I look back now, and I truly appreciate my Mom always trying to get a good meal on the table even though she was exhausted most days and didn’t feel like going to the grocery store after work and then coming home to make dinner. My Mom usually made this with canned biscuits (which you can too if you like.) But these days I like to make it with Bisquick to keep the dumplings nice and fluffy. 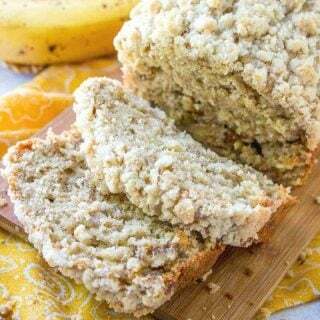 This is a really versatile recipe so go with whatever you like and what is easiest for you. 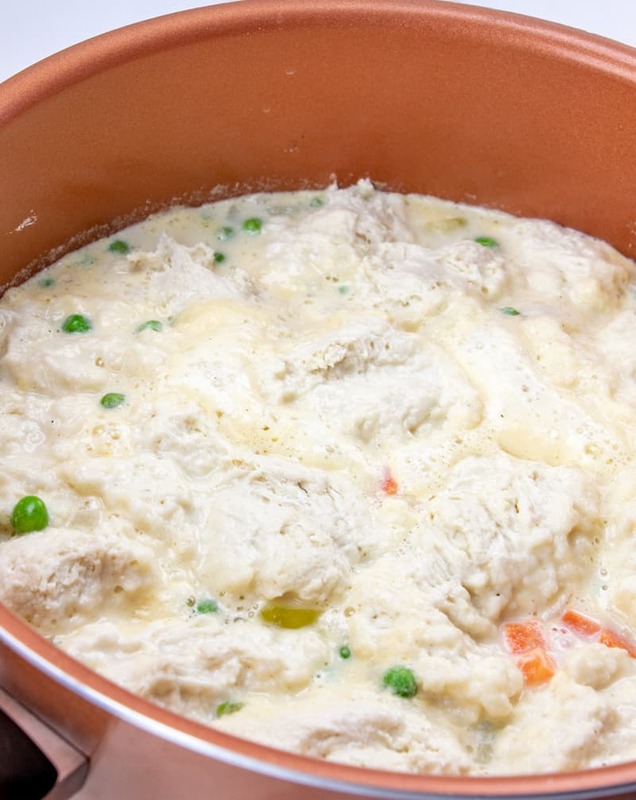 Note: For a creamier chicken and dumplings, use a can of cream of chicken soup instead of the chicken gravy packet. All the other ingredient measurements remain the same. 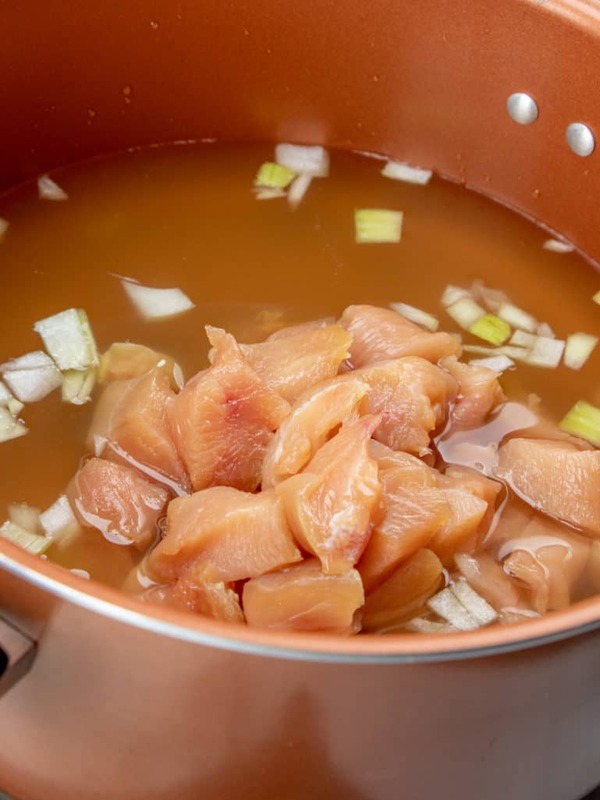 Place a large pot on stove over medium high heat, add chicken broth, diced onion and diced chicken tenders. Cook until onions turn soft and chicken is cooked. Season mixture with salt and pepper. In a small bowl, whisk together gravy mix (or cream of chicken soup) and milk. Pour into pot. Stir and bring up to a boil (to thicken slightly.) Add frozen peas and carrots. In a medium bowl, combine Bisquick with warm water. Stir until combined. Drop tablespoonfuls of prepared mix into the pot, spacing dumplings as evenly as you can. Cover pot tightly and reduce heat to medium low. Steam dumplings 8-10 minutes. 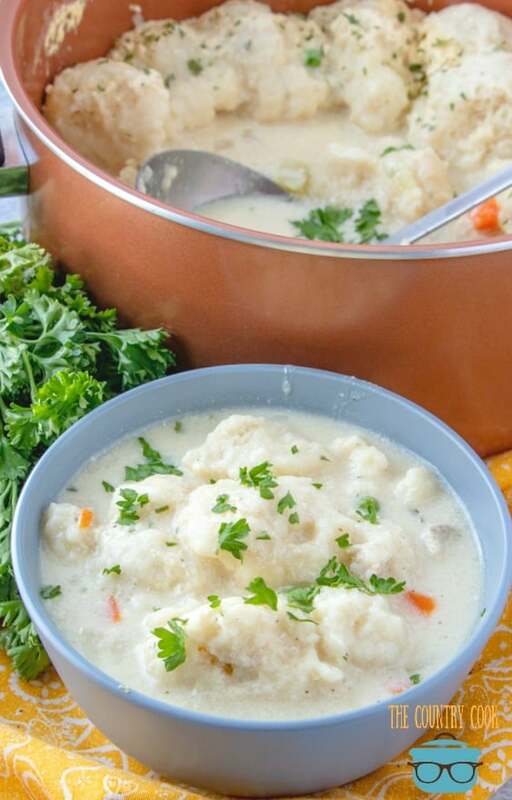 Cook’s Notes: Chicken and Dumplings don’t always make the best leftovers. The dumplings will continue to absorb the liquid so when you make this, be sure you’re going to eat it all the same day. 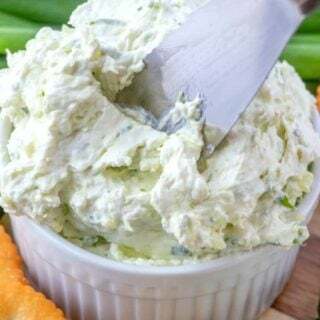 Also, if you’d like, you can use some rotisserie chicken in this which gives it a wonderful flavor or if you have leftovers from a roasted chicken. 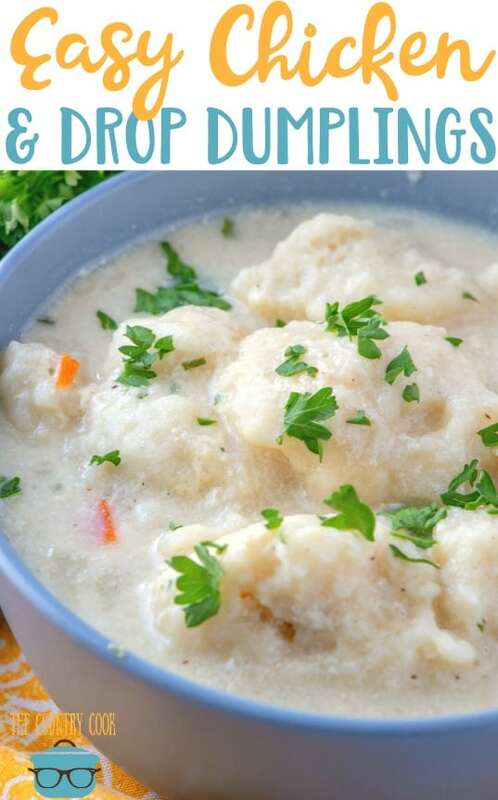 This Easy Chicken and Drop Dumplings recipe is full of flavor and can be made in about 30 minutes. 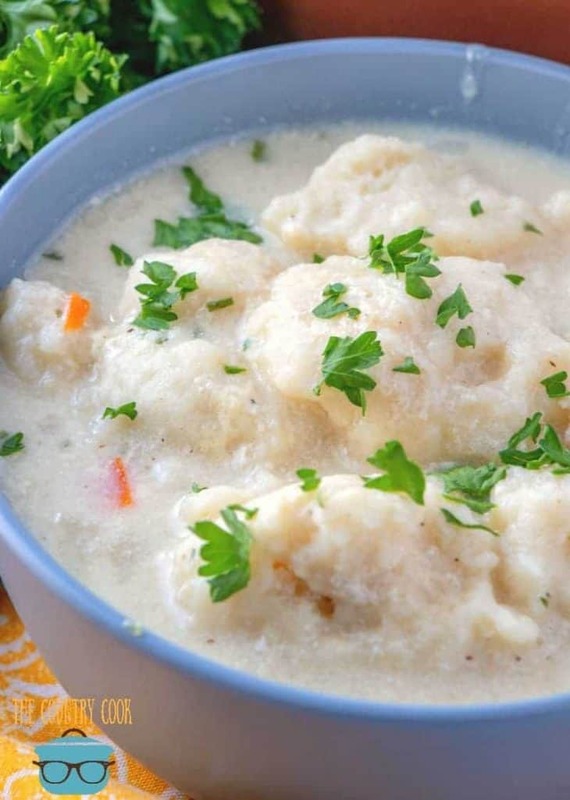 A creamy broth, tender chicken and fluffy dumplings. 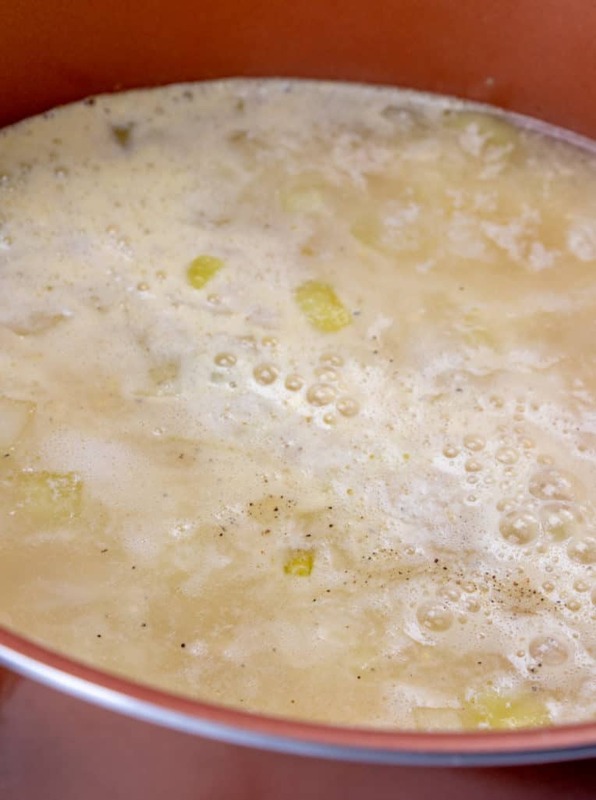 Place a large pot on stove over medium high heat, add chicken broth, diced onion and diced chicken tenders. Cook until onions turn soft and chicken is cooked. 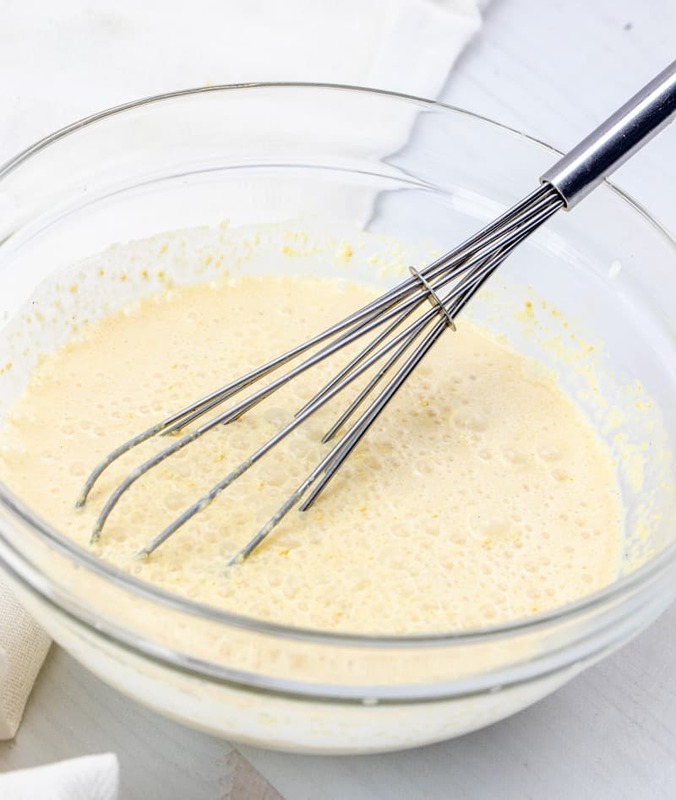 In a small bowl, whisk together gravy mix and milk. Stir and bring up to a boil (to thicken slightly). Add frozen peas and carrots. In a medium bowl, combine Bisquick with warm water. Cover pot tightly and reduce heat to medium low. 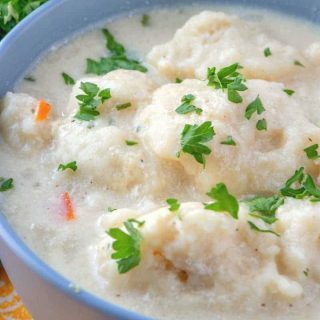 *For a creamier chicken and dumplings, use a can of cream of chicken soup instead of the chicken gravy packet. All the other ingredient measurements remain the same. *Chicken and Dumplings don’t always make the best leftovers. The dumplings will continue to absorb the liquid so when you make this, be sure you’re going to eat it all the same day. Also, if you'd like, you can use some rotisserie chicken in this which gives it a wonderful flavor or if you have leftovers from a roasted chicken. Craving more dumplings? 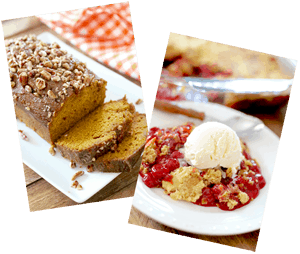 Be sure to look at these scrumptious recipes! It looks delicious! One of my favorite dishes. I actually have a character in my book who also loves Chicken and Dumplings. May I share this on my blog? Ugh, I wish I could have some of this right now! It looks amazing! We never had this growing up. My Dad wasn't a big soup fan, and putting dumplings in there would not have gone over well with him. Me on the other hand, I can't wait to try this!! My Grandma used to make Chicken and Dumplings, as well as chicken and home made noodles. 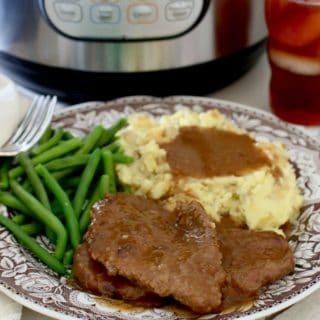 Pure Southern comfort food for sure! Thanks for the memories! 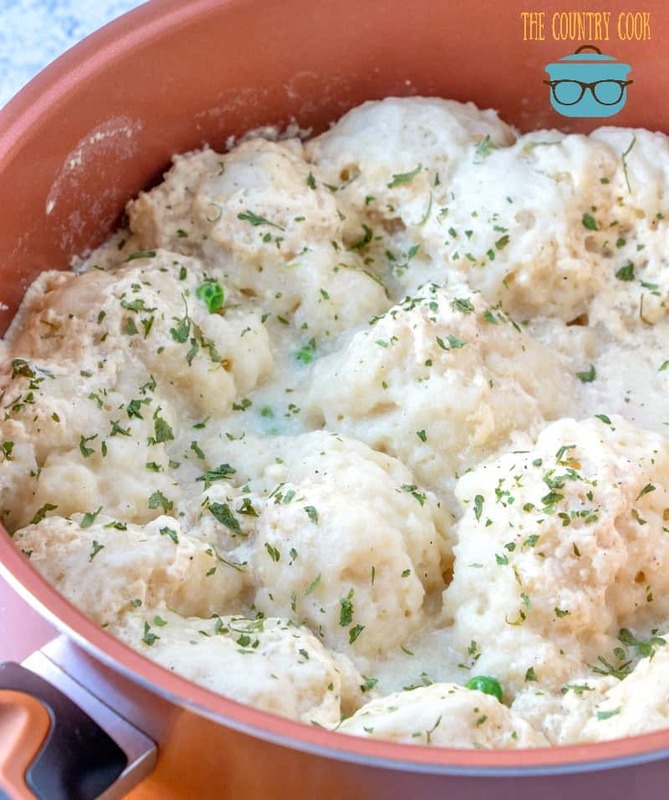 I haven't had chicken and dumplings in the longest time and haven't ever made them myself (I usually order it at Cracker Barrel.) This is going to be perfect to make on a cool Fall day! I have this on my stove simmering right now. thanks for the recipe..so easy!! It looks wonderful! This looks so good! I was just wondering if it can be made in the crock pot? Hi Kim! As much as I love my Crock Pot, I probably would not recommend this recipe for it. I think the broth would be fine in it but not the dumplings. In order for them to stay on the fluffy side, they need to be steamed in the pot for just a few minutes. 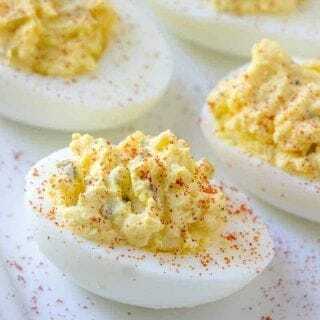 You could try adding them in the Crock Pot during the last 15 minutes or so of cooking. You just don't want them to get too dense or be too mushy in the middle. Hope that helps! Definitely a keeper! My husband ate this for three days in a row! I added a few more frozen veggies (a cup each of corn, green beans, and carrots, since I didn't have the mixed peas and carrots). 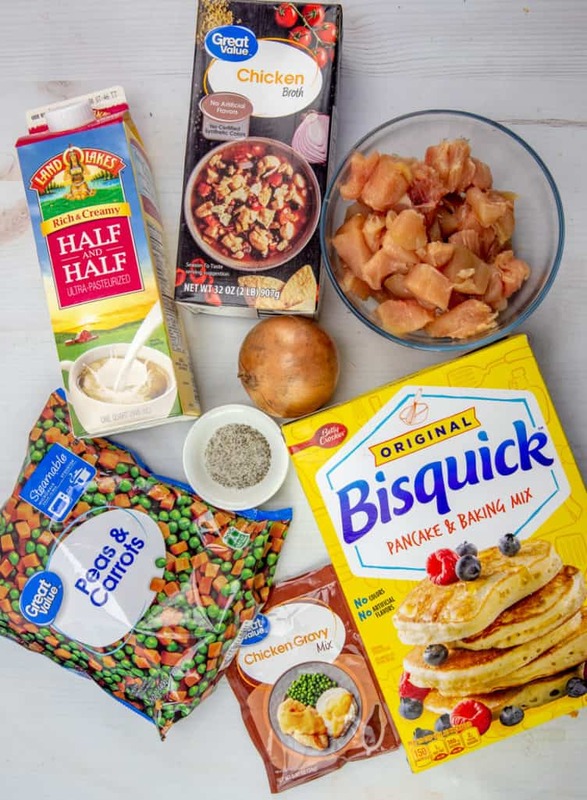 I also had to make a sudden grab for the Joy of Cooking, for a pancake mix recipe, since I was about to add the dumplings and realized there was no Bisquick in the house! But it turned out great, my husband loved it, and it was super easy and fairly quick to make. I'll be making it again, probably pretty frequently. Thank you! That is so great to hear Moira!! Love that you still made it work. Thank you so much for letting me know how it turned out for you! I love that you use GV brands. This was so good. Thank you! 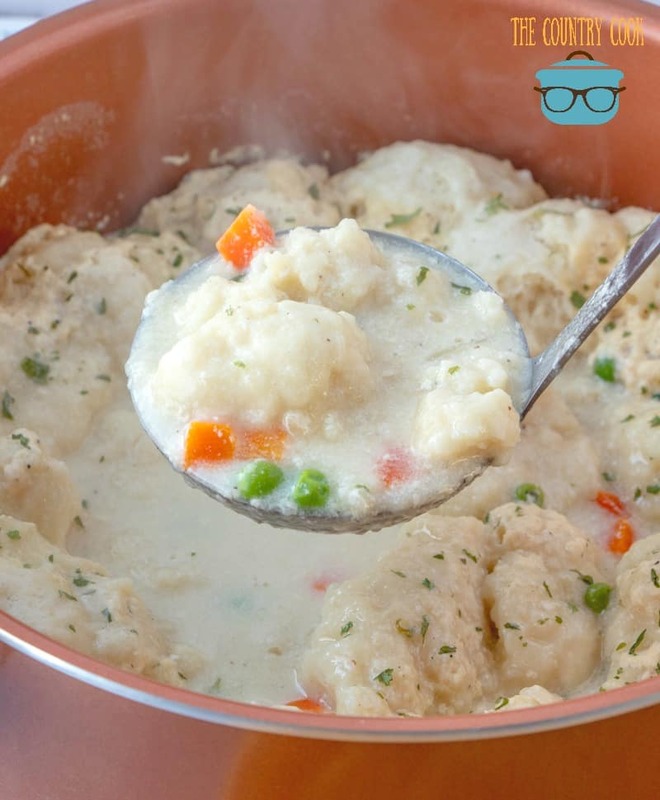 This is a good recipe but I didn't have chicken gravy so I substituted with chicken bullion and found that the dumplings thicken the broth well. 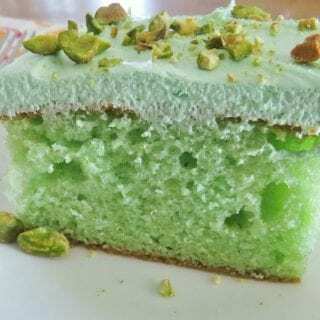 I spotted this recipe on the side of your blog.. then had to search for it. I made it and didn’t change a thing. Tasted just like what my Mom used to make in the 80’s. This was great! Whole family loved it! Added small clove of garlic, minced. Also added both the chicken gravy mix and the can of cream of chicken soup. Turned out great, will make again. Hi, I made this again tonight…its soo delicious! 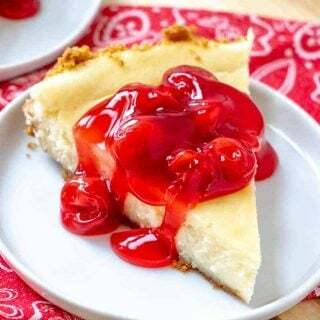 I love your site and have cooked many many of your recipes! This was a hit at my house. I doubled it as I had a large rotisserie chicken. Since I doubled it I had leftovers so I used a slotted to spoon to remove the dumplings from the liquids. Refrigerated liquids and dumplings separately and then combined them and reheated gently on stove until just warm through. Just as good the second time around. We enjoyed cranberry sauce and a salad with the it. For the drop dumplings. 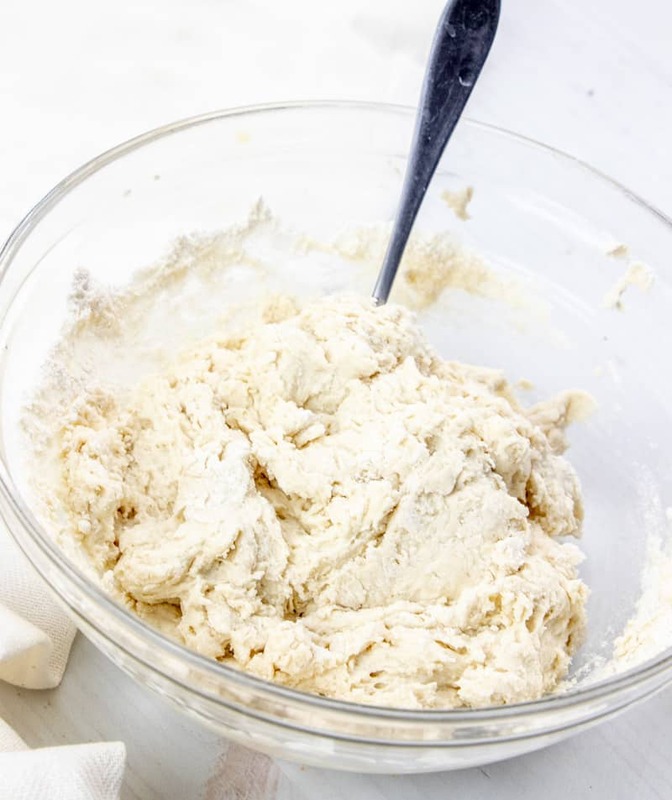 Do you use a teaspoon or tablespoon to measure the dumplings before you put them in the pot? I find that if I make them too big they don’t cook all the way through. Make sure your stew is on medium heat and bubbling a bit, before adding dumplings. I use a tablespoon to drop them into stew. Let them steam with lid on for 15 mins.Dont lift lid at all during this time! They should be cooked perfectly by then. My drop dumplings always fall apart. Need to follow this recipe!! This recipe brings back childhood my memories of Mom making beef Tewa and dumplings for a Monday meal. The stew was Sunday leftovers. It was one of my favorite meals as a kid. Tonight I followed your recipe for my granddaughter and her fiancé. They loved it. Thank you!